• Reusable, Easily Peels Off & On To Stick To Phones, Tablets, Etc. string(57) "1/2" x 7/8" (Ear buds) / 3 1/2" x 2 1/8" (Marketing Card)"
string(37) "15-20 working days after art approval"
string(59) "1/4” dia. 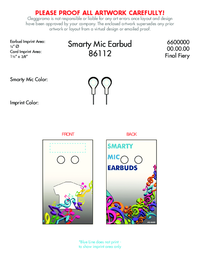 (Ear buds) / 1 1/2” x 3/8” (Marketing Card)"